A tipping point for the Aussie dollar? Weeks of quiet trade in the Australian dollar ended abruptly on Friday as AUD/USD sank under 73 cents to lows dating to January 2017. Turmoil in Turkey was the catalyst, as the Aussie showed its sensitivity to the global equity mood. But is there more to come? The Australian dollar traded very calmly from late June to early August, not leaving a US$0.73-0.75 range. This was in large part due to US dollar stability against key currencies such as the Euro, with the monetary policy outlook at the Federal Reserve and European Central Bank seemingly clear after sharp adjustment in June. But AUD also found little inspiration in Australia’s domestic data and events. 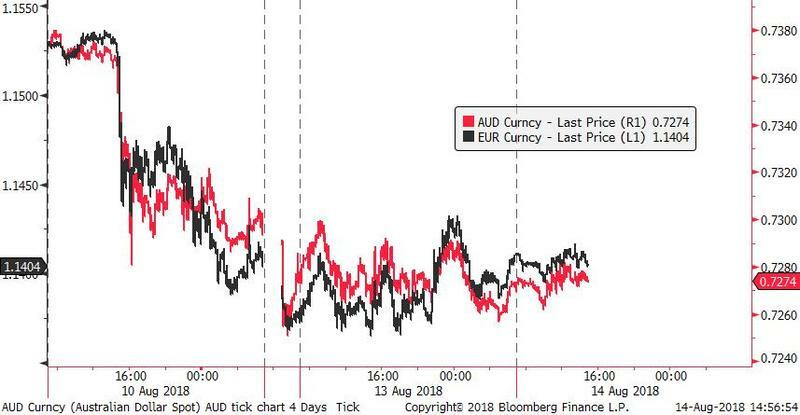 The RBA’s familiar outlook for no change in the cash rate for some time has reduced the FX market sensitivity to Australian data releases such as employment and retail sales, given that it is hard to see when the RBA will next hold a meeting that is “live” for a rate change. Such stability perhaps made the Aussie more vulnerable to a deterioration in global sentiment. The tipping point appeared to be news reports that the ECB was worried about the impact of the sliding Turkish lira on some large Eurozone banks. The fall in the euro was logical but some might have been surprised that AUD/USD tumbled at the same time, finally breaking below 73 cents and reaching 19 month lows in the mid-0.72s. After all, Turkey accounts for just 0.4% of Australia’s exports. Yet there is little doubt that the Aussie remains a risk-sensitive currency, not a safe haven. This was seen most spectacularly in the GFC, when its 30% fall against the US dollar marked it as the weakest G10 currency, only to surge in 2009 when equity markets and commodity prices rebounded. To be sure, AUD pays limited attention to equities when there is no major directional guidance. 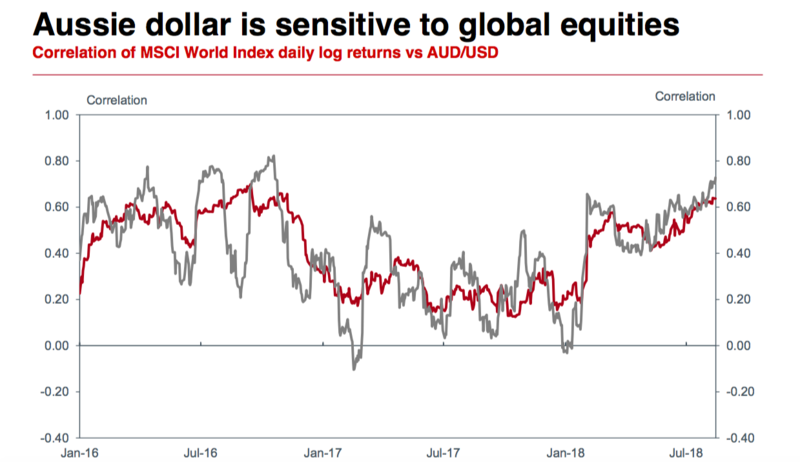 But as the chart shows, AUD/USD typically finds it hard to ignore global equity swings, showing a consistent positive correlation. So we suspect it was the broad-based deterioration in global risk assets such as equities that has hurt the Aussie in recent days, rather than concern specifically about Turkey. Weakness in global equities implies a fall in investor optimism over economic growth and thus a potential decline in demand for Australia’s key commodity exports. Moreover, a souring of risk appetite can hurt AUD by constricting capital flows, given Australia continues to rely on attracting foreign capital. Westpac forecasts Australia’s current account deficit to widen from -2.4% of GDP this year to -3.4% of GDP in 2019, or –A$65bn. Such deficits are easily funded at times of global optimism but when investors lose confidence, the Aussie usually needs to cheapen. There is also the danger of global fund managers with exposure to Turkey or its closest trading partners selling “winners” in unrelated markets to cover losses elsewhere. There is no easy solution for Turkey to the 45% slide in the lira this year, even if it stabilizes near term, with inflation already above 15%. If equity sentiment deteriorates further in coming days, AUD/USD could probe the 0.7150/75 area. But it is hard to see Turkey dominating global market attention for much longer. ECB president Draghi famously pledged to do “whatever it takes” to ensure Eurozone financial stability and he has the runs on the board in this regard. AUD/USD should also take comfort from the lack of panic in commodity markets. Westpac’s export-weighted commodity price index remains well within this year’s ranges, with resilient thermal coal and iron ore prices offsetting the pullback in metals prices. Indeed, the latter seem more focused on US-driven trade tensions, so it may not be long before market attention swings back to the threat of tariffs. For instance, the US review of proposed tariffs on a further $200bn of Chinese imports could be complete in September. Short term, AUD/USD could recapture much of the ground it lost on the Turkey crisis if equity sentiment stabilizes, aided by what still looks to be a year of above-average growth for the global economy. The 0.74 area could become familiar once more. Thanks for sharing your views Sean and a useful summation of what's taking place. Hi Sean, thanks for your piece however do you mind clarifying the series coloured in red. Both red and grey series appear to be correlation series??? Also, using the unhedged global equity index returns will cause correlation to be higher anyway??? Good pickup, Jay, the labels aren't visible - the red line is 60 day correlation, the grey line is 30 day. I am using MSCI World Index in US$ terms so there's plenty of scope for the daily % changes in the 2 series to diverge but lately the relationship has tightened, even though AUD/USD had been range-bound until last week. The currency of our critical trading partner the Yuan is "dropping like a stone" along with a collapse in the Bloomberg commodities index. Is this not an ominous sign? Peter, Westpac's year-end AUD forecast in the Feb 2018 monthly report was 0.72. End-Sep forecast was 0.74. And yes, they are sometimes revised! Commodity prices are indeed under pressure this week though our daily index is still in about the middle of the range of the past 5 years. I agree we need to watch the yuan but the PBoC has $3 trillion of FX reserves to ensure it doesn't fall too fast.